WHOAAAAAAAAAAA there Bud Light! You’re really gonna do this to me RIGHT before the holidays?! Jesus Christ, pray for the three of our livers, because something tells me one of us is bound for certain, swift death after the announcement of this promotion. This is a pretty great contest, this is kinda like the Keystolope – a special orange can of Keystone Light hidden in very few racks of the beer – except it actually has a prize involved. This funniest thing about this contest is that Bud Light claims they’re giving a fan tickets “for the rest of their life”. What, I’m not gonna live to see 72!? Actually, probably not if I’m drinking enough Bud Light to actually win this thing… But still, 51 years seems a little short. Go ten toes or nothing, A-B. 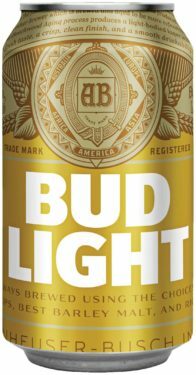 Consumers must purchase special-edition packs of Bud Light for the chance to find a gold can, or they can visit com to download and print a gold can wrap. 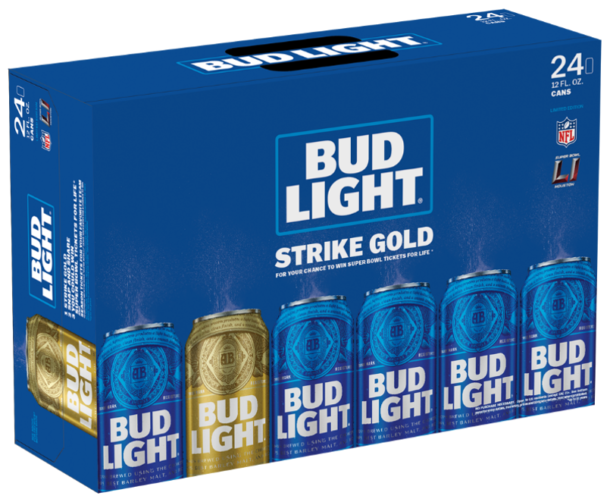 Consumers can enter the sweepstakes by taking a picture with the gold can and posting the sweeps hashtags (#SBTix4Life and #Sweeps) on Facebook, Instagram, or Twitter and/or on BudLight.com*. Six weekly winners during the promotional window will be selected to win a pair of season tickets to their favorite NFL team. One grand prize winner will be selected to win a pair of Super Bowl tickets for life (up to 51 years) the week of Jan. 16, 2017. *Consumers entering in California simply must take a picture showing their fan spirit and post on social media (Facebook, Instagram, or Twitter) with the hashtags #SBTix4Life, #Sweeps and #CA. Wait, what? Not only do you not even need to find a gold can, people in California only have to submit hashtags in tweets to win the contest!? If I’m Bud Light, I’m retracting this whole contest and starting it over. Make one gold can for every state in the USA, throw it in a rack, and make all 50 winners fight to the death, Hunger Games style, to determine who gets the Super Bowl tickets. If you’re reading this, A-B, hire your boy. Keep track of our impending liver failure as we try to win this contest on Twitter at @WickedGoodGames.